Dividing marital property in Williamson County and throughout Texas, is an aspect of divorce that can cause heated arguments, particularly in cases involving high-assets divorces or where a substantial amount of debt needs to be divided. Spouses might disagree over who brought what items into a marriage or which spouse is entitled to ownership of property, money, cars and other personal belongings. There are common myths regarding the division of property as part of a divorce that might suggest that each spouse is entitled to receive half of all the property. However, in Texas, that isn’t always the case. Experienced property division lawyers are familiar with what steps need to be taken in order to ensure that your property gets distributed during your divorce in a way that benefits you. So what qualifies as marital property exactly? It can simply be defined as anything that contributes to a person’s wealth or that has exchangeable value. It can include anything that generates wealth or that a spouse owns – from retirement plans, to furniture to cars and more. A business that you own might also be divided as part of your divorce process. Generally speaking, property acquired during marriage by means other than gift or inheritance will be marital property. One of the most widespread myths regarding marital property division that occurs as part of a divorce is people believing that the 50/50 rule is adhered to by Texas. That suggests that a spouse in a divorce is always entitled to receive half of everything. This 50/50 rule implies that each of the spouses contributed equally to the wealth of the family and should be granted rights to the property appropriately in a divorce. However, the 50/50 rule is not utilized by Texas, but instead uses the “equitable distribution” standard. Equitable means ‘fair’ instead of equal. What is fair, of course, is frequently subject to fierce debate. So unless the parties are able to settle ahead of time, the case will be reviewed by a judge to ‘fairly’ divide the property. It might result in a 50/50 split, or it could mean one partner getting a lot less or more than the other one. For this reason in addition to others we strongly recommend that you consult with an experienced divorce attorney to ensure that you get an ‘equitable’ distribution of your overall marital wealth. 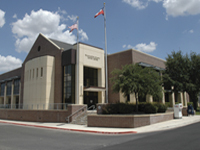 Leo Foust Family Law Attorney property division lawyers for Round Rock can help you better understand the division of marital property process and create a plan that will help to protect your property and secure the assets that you deserve and need. Debt, like property assets, during a divorce might be considered to be a shared responsibility and be subject to being divided between spouses as part of a divorce process. Financial hardships leave numerous couples behind on payments and underwater on mortgages. Like with dividing assets, when dividing debt a court will examine the details of the divorce case and attempt to ‘equitably’ divide the debt. Leo E. Foust and his staff can help you better understand what role debt plays as part of your divorce.